Henry Disston & Sons of Philadelphia, PA made more handsaws than any other manufacturer in history. The vast majority of these saws were made for woodworking, but Disston also made saws for cutting metal. The metal cutting saws came in the form of standard-shaped handsaws as well as large backsaws suitable for use in miter boxes. 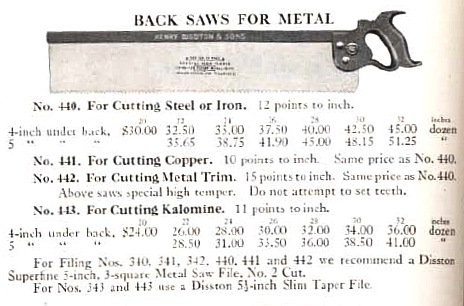 The 1918 Disston catalog lists four miter saws for cutting various types of metal (Figure 1). Figure 1. Disston metal-cutting backsaws in 1918 catalog. I had an opportunity to sharpen one of these metal-cutting miter saws recently when a customer bought one online and had it sent directly to me for sharpening before it went to him. Since these saws are uncommon and there is very little information on them, I thought it might be helpful to others to capture my experiences in this article. The saw that was sent to me was a 26” Disston & Sons saw with 4” of plate under the spine (Figure 2). There are 12 points per inch, which is consistent with the No. 440 saw in the Disston catalog. The medallion indicates the saw was made during the 1896-1917 period. The spine is stamped with the usual Disston & Sons logo of the period. 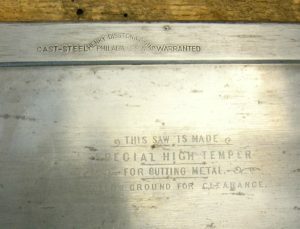 The plate is etched with the following: THIS SAW IS MADE SPECIAL HIGH TEMPER FOR CUTTING METAL HOLLOW GROUND FOR CLEARANCE (Figure 3). Figure 2. Disston metal-cutting miter saw. The hollow ground (or more accurately, tapered) plate on this saw measures approximately 0.040” thick at the toothline, 0.033” midway between the toothine and spine, and 0.026” just below the spine. This compares with a consistent 0.036” for a similarly aged Disston wood-cutting miter saw I have in my shop. The purpose of the tapered plate is to prevent binding of the saw in the material being cut while avoiding having to set the teeth. 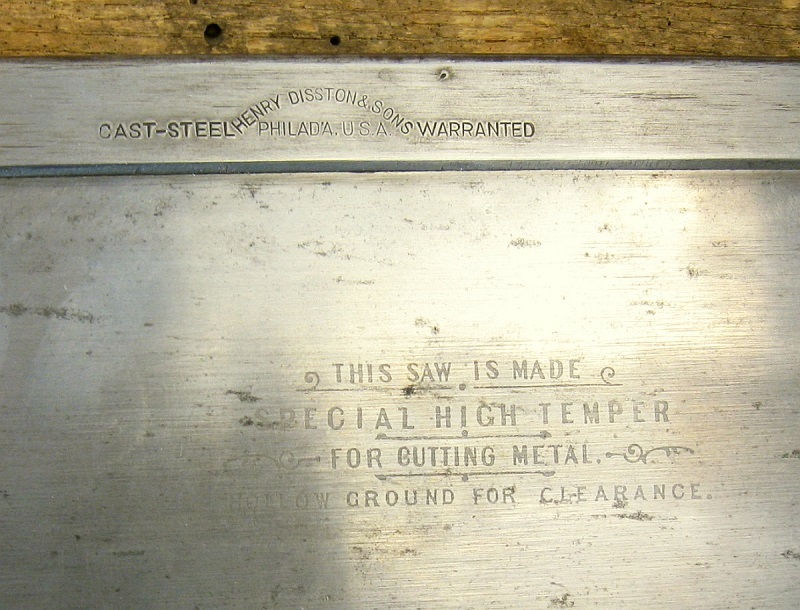 Note the Disston catalog image above says, “Do not attempt to set teeth.” The “Special High Temper” of the plate makes it harder and/or more brittle than a regular saw, which would cause the teeth to break if setting was attempted. Figure 3. Spine stamp and plate etching of Disston metal-cutting saw. The first decision in sharpening the saw was to determine how it should be sharpened. A wood-cutting miter saw is typically filed as a crosscut saw at 11 points per inch. Nearly all cuts in wood on a miter box are crosscuts, and the crosscut filing produces knife-edged teeth that sever the wood fibers that compose the grain of wood. Metal, however, has no fibrous grain. Knife edges would not hold up well when cutting metal; chisel-shaped teeth, as found on a rip saw, would be more effective. A close examination of a standard hacksaw blade confirmed my belief that a metal cutting saw should be filed as a rip saw, that is, with zero degrees of fleam angle. I usually file my woodworking rip saws with a negative 8 degree rake angle on each tooth. This makes the saws relatively easy to start and to push through the cut. Some people file rip saws with less rake, even zero degrees in some cases. But what rake angle should a metal cutting saw have? Again I looked at a hacksaw blade. The teeth seemed to have little, if any, rake angle. The teeth on a hacksaw, however, are much smaller than the teeth on this miter saw. An aggressive, zero degree rake on a miter saw would make it difficult to push through metal. My instinct told me to go with 5 degrees of negative rake, and that’s what I did. This saw had been filed before, but not very well. The first step in filing a saw is jointing. Since I suspected the metal in this saw would be harder than most saws, my desire was to remove the least possible amount of metal during jointing. This would then result in less metal removal during sharpening. However, jointing revealed that there were patches of teeth that were lower than others. This resulted in having to remove about one-third the height of the tallest teeth in order to get all the teeth even. Jointing proved that indeed the metal was harder than usual. It took many jointing strokes to complete the job, and it was hard on my jointing file. The teeth were not so mis-shapen from the previous filing that significant re-shaping of the teeth was required. Therefore, I could go straight from jointing to the final sharpening. I selected a 6” NOS American made Nicholson double extra slim taper file for the job. This was not only because it is a quality file, but also because the edges of the file are particularly narrow. Not all double extra slim files are created equal. For a saw with 12 points per inch, you want a pretty narrow edge to prevent the gullets from being too wide and shallow. Upon starting to file, it was apparent that I selected the correct rake angle. The file fit exactly in the angle from the previous filing, which was likely the same as the factory rake angle. The filing progressed slowly but without issue. The metal in this saw is definitely harder than most saws but still very workable with a good file. You should probably count on getting about one saw like this out of a file before it is used up. I’ve not tried cutting with the saw since it was filed. I’ll send it on to the owner. Perhaps I’ll be able to update this article with results after getting a report back from him on how the saw cuts.